Tad Miyano was inspired by Monson Railroad’s combine. 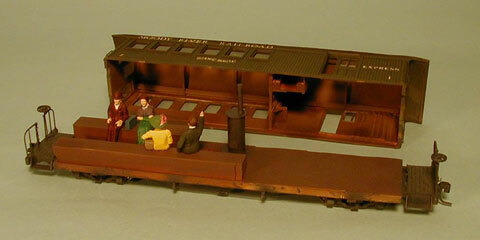 The short length of this combine is perfect for the small 2-foot gauge railroad. Tad’s added an interior and populated it. As of this posting, Portland Locomotive works has announced that it’s working on a kit of the combine and a freelanced RPO and coach based on the same roof and frame. All Sn2 modelers can look forward to having a similar model. Click on the Portland Locomotive Works link at right to learn more. This entry was posted in Monson, Passenger Car, Tad Miyano. Bookmark the permalink.